1. From the Calendar page of the Members Corner, click on the Scheduling Wizard tab. 2. Fill in the client’s location and (if appropriate) the Business Status, Specific Mentor Skill that was requested, or Specific Mentor requested. 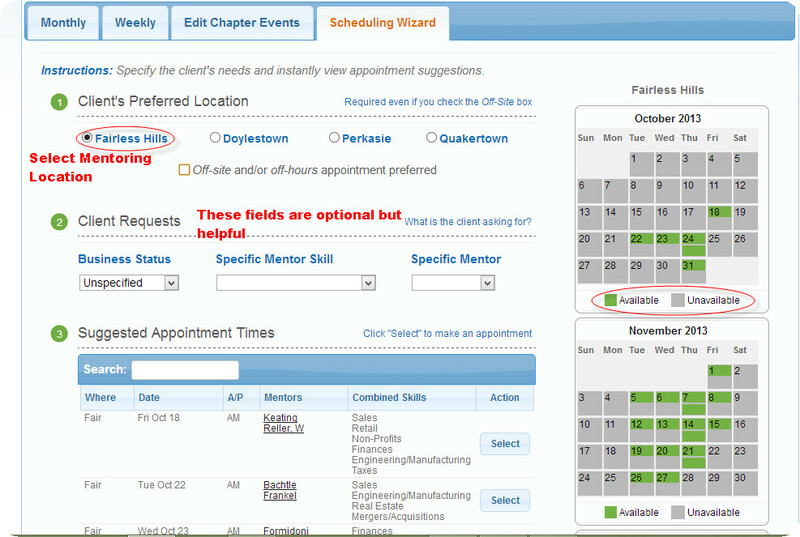 You’ll instantly see a list of appointment times that meet your criteria. First, click the Add Appointment button to get a new empty line for you to fill in. A full morning will have a 9 AM and a 10:30 AM appointment (9:30 and 11:00 am for non-Fairless Hills sites) . Accurately fill in the client’s name, phone number, and email address. (Obsolete) Check 641 if you know that a 641 has been created. Briefly summarize the client’s needs in the Information box. Press Save to save the appointment in the database.